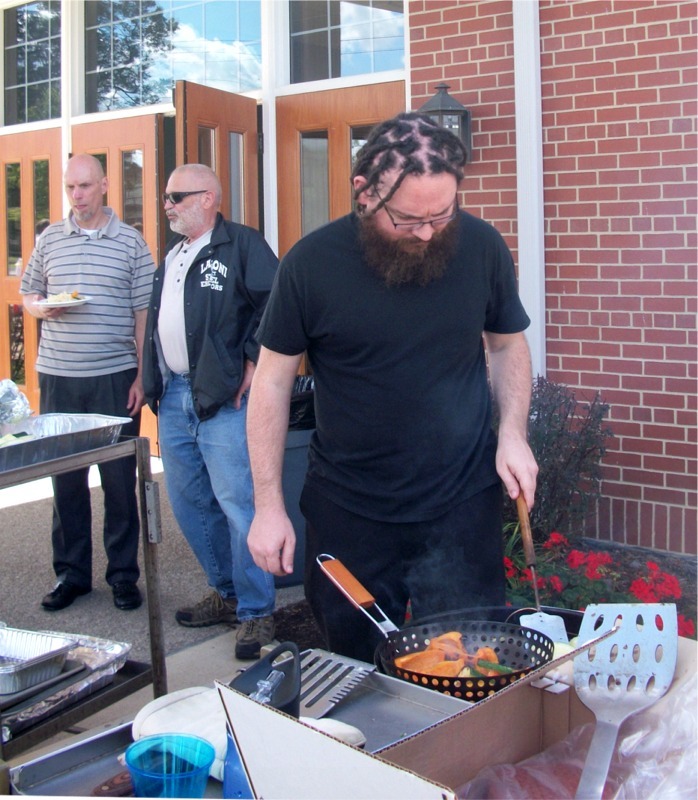 St. David’s, Peters Township, kicked off its program year with a community cookout today. I drove over to the church after the service at St. Paul’s. I wanted to see how many people showed up for the 10 o’clock service and for the cookout that followed. It seems fair to say that the event was a great success. You can read about it and see some of my pictures on my blog, Lionel Deimel’s Web Log. 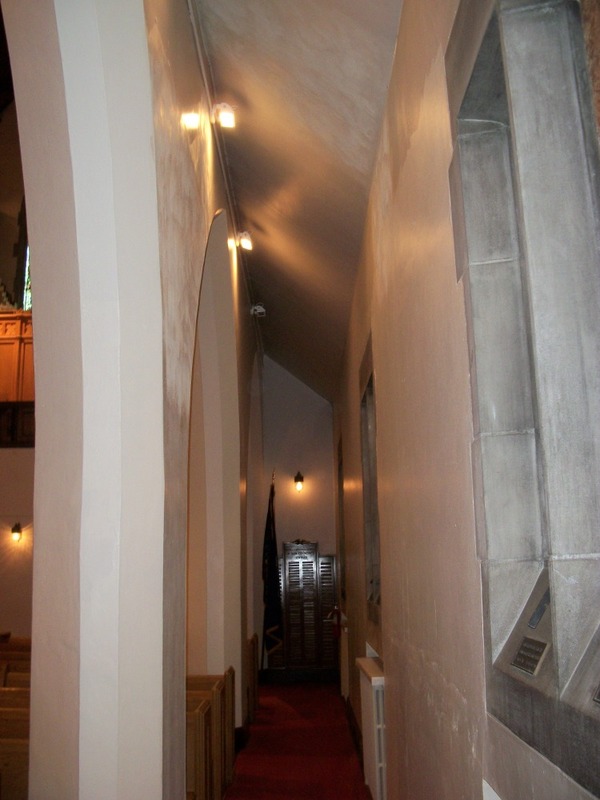 In my post “Back at St. Paul’s,” I noted that a number of spotlights were burned out. 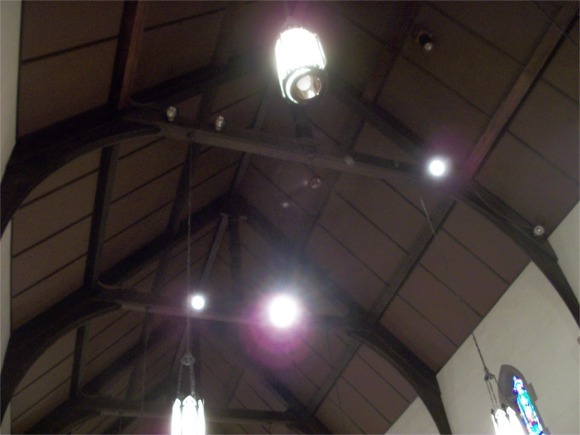 Because those lamps are either on a roof truss or on the ceiling of the church, they are difficult to replace. This past Sunday, I noticed that, not only the three spots on a truss near the crossing and two spots on the ceiling are dark, but so are four (or perhaps five) other lamps that are more easily replaced. More personally irritating is the fact that the down light in the lantern over the chancel just behind the organ console is out. (See photo at right.) The failed lamp is over the chair where I sit in the choir. This area is dark in the best of circumstances, in part because one of the spots in the chancel that should be pointed in my direction actually points somewhere else. To make matters worse, it appears that one of the bulbs in the lantern over my head is also burned out. In general, the chancel is darker than it should be because the floodlights behind the arch at the back of the chancel are unusable. They should have been moved higher up on the arch when the exposed organ pipes were installed in the sanctuary, but they were not. They cannot be used because they heat up the pipes and throw the organ out-of-tune. But I digress from purely maintenance issues. 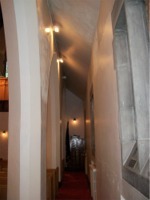 There are two lanterns over the freestanding altar. 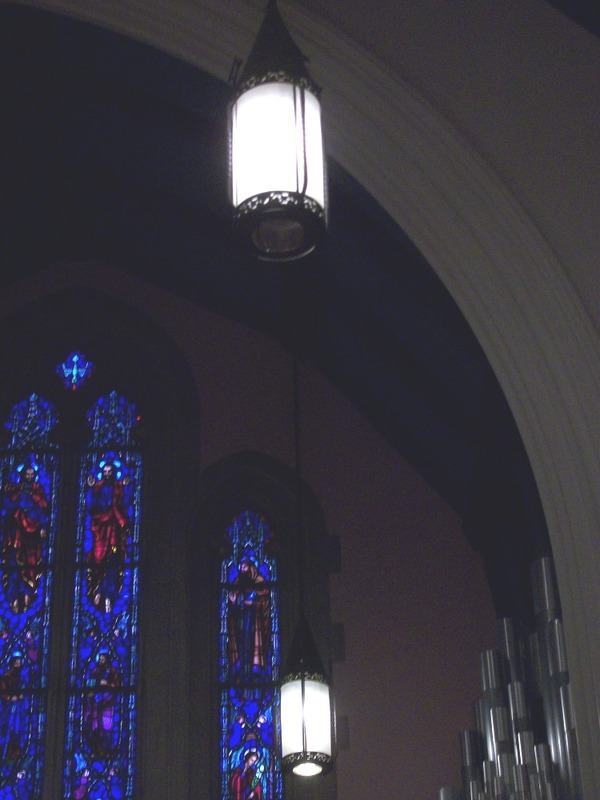 The down light in the lantern closest to the pulpit is burned out, and it looks as though the lantern itself is not quite properly assembled. This can be seen in the photo below. which also shows four of the five spots above the crossing that are not illuminated. on the ceiling and roof truss can also be seen. Given the extreme height of the spotlights that are burned out and the consequent trouble and expense attendant replacing them, it is understandable that the spots are not replaced as soon as they burn out. With five lamps out, however, it is time to do whatever it takes to replace the bulbs. In fact, all the lamps on the trusses or ceiling should be replaced at one time. On the other hand, the lamps in the aisles and lanterns can be replaced using a ladder. Someone should be responsible for checking every week that all lamps are working. Lamps that can be replaced with relative ease should be. Why is no one paying attention? 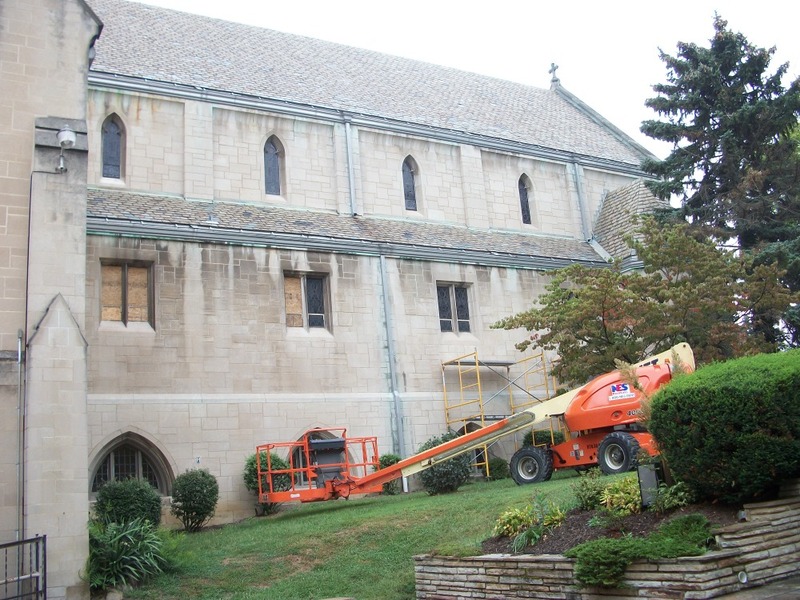 It was easy not to notice the removal of the clerestory windows, but the absence of the windows in the side aisle will be more conspicuous. 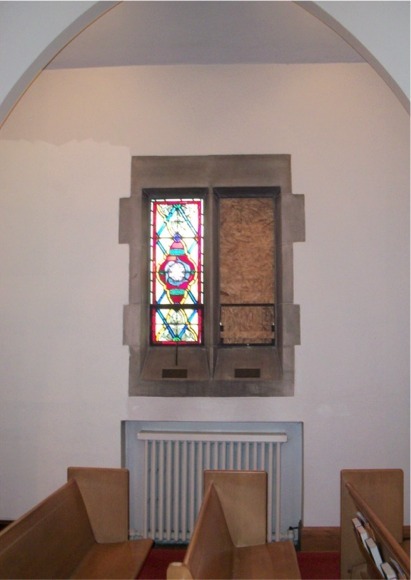 Work on the stained glass windows is to be completed by Christmas.